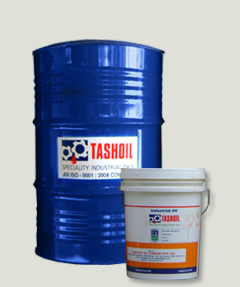 Gun Drilling Oil :: Tashoil Company Pvt. Ltd. Gun Drilling Oil is also known as a deep hole drilling oil. This Gun Drilling Oil containing a special EP Additives & other performance enhancing additives. This oil is formulated from a highly purified low viscosity base oil, which is not only used as a coolant but also it penetrates deep enough to give superior Lubricity & removes the chip very quickly. It also with stood a wide range of operating pressure & temperature. better Lubricity & Excellent cooling. TASHCUT D GD-1 can be recommended for any type of Gun Drilling & Ejector Drilling Operation for Ferrous metal, which involves drilling of holes to a depth in to 200 to 300 times hole diameter. It is also recommended where quick chips removal is required as tool travel speed is approx. 150 to 200 mm per minute.